Few day ago in my tutorial i told you about how to save any web page as PDF file in mozilla Firefox.Today in my tutorial i will going to tell you how to save any web page as PDF in any web browser. 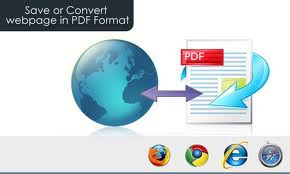 It s very easy and simple method it take only few seconds to save a webpage as PDF.This method is tested in almost every browser and ts working fine so you can use it to save webpage as PDF.So without wasting more time let see how to do that. 1. )Go to http://www.bullzip.com/products/pdf/info.php and download the bullzip PDF printer . 2. )After downloading install this PDF printer .You can see some of my screen shots below of how to installing it. 2. 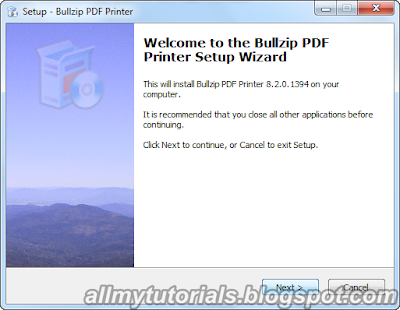 )Once you install it .Now if go to that web page that you want save as PDF .Now give print command (CTRL + P) on that web page and select bullzip printer and then click on OK now you web page will save as PDF file. 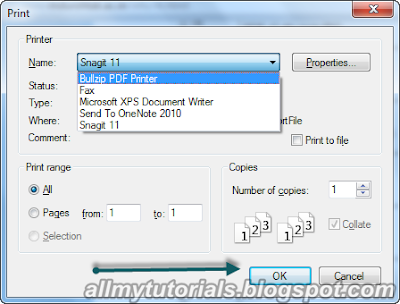 That it you have to do to save any web page as PDF it working in almost every web browser.So go and give it a try .I hope you all like my post , if you have any query please leave comment in comment section and don’t forget to subscribe to my blog.